The Coastal Freighter G.B. Church was built in Goole, England in 1943 and served in World War II as a supply ship for the allies in Europe. After the war, the ship was used for hauling explosives in and around British Columbia. The ship had originally been named the Cerium, but was renamed by Bill Church after his father, George Bennett Church. 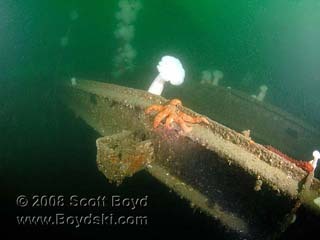 This delightful wreck dive was the very first project completed by the Artificial Reef Society of British Columbia. They successfully prepared and sank the ship off of Portland Island, in the Princess Margaret Marine Reserve near Sydney. Today the G.B. Church rests upright on the bottom in very protected waters that are but a few miles from the San Juan Islands. The main deck is only about 50 feet below the surface, and a white mooring buoy is attached to the mast, which rises up to within 20 feet of the surface. 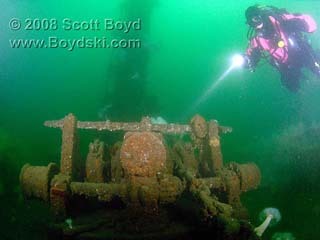 Visiting divers from the U.S. can easily scoot over from Roche Harbor or West Beach in just a few minutes and enjoy some spectacular wreck diving. Huge Ling Cod and Rockfish are found throughout the wreck, which is still in great sh ape considering this 175 foot long ship was sunk on August 11, 1991. The wreck has been thoroughly cleaned and lots of diver access holes are provided, making this an easy dive for all levels of divers. Charter operators out of Sydney or Victoria regularly visit this artificial reef, but if you're out in a private boat in the San Juans, it would be a crime not to visit one of the best dives in the area.